The LG V40 release date is quickly approaching and potential buyers are weighing all of their options. With five cameras, the V40 is an exciting new phone. Here’s everything you need to know, then we’ll compare it to the LG V30 for those interested. If you’re hunting for your next big phone the LG V30 or the Galaxy Note 9 are likely near the top of your list. However, they’re not your only options coming later this fall. Multiple leaks suggest the “LG Storm” will arrive as the LG V40 and have a lot to offer buyers. Features like an edge-to-edge display, five cameras and the latest version of Android. There’s plenty to get excited about. Here we’ll go over the rumored specs, screen size, cameras, and a potential October release date for those interested. Then, compare that information with the V30 from last year. This will help you decide if it’s worth waiting for, how much it might cost, and other info to help buyers make the right decision. The LG V30 went on sale last year, so most buyers know plenty about it. Not to mention it’s similar to the LG G7 from earlier this year. That said, we are expecting some important changes in 2018. Mainly the additional cameras on the front and the back. Something we’re hearing Samsung could do in 2019 with the Galaxy S10. Both of these phones have huge screens, tons of power, plenty of storage, and more than one camera on the back. However, one might have an extra camera on the front AND the back, an even bigger screen, and other noteworthy changes you’ll want to wait for. There are pros and cons to each, and you’ll have to decide which ones are more important to you. Obviously, the first thing we need to discuss is the display. It’s one of the most important aspects of any smartphone purchase. The V30 is LG’s first OLED display in a flagship phone, and it looks pretty great. It comes in at 6-inches and has even smaller bezels than the Galaxy S8. Meaning the front is almost all screen, and it looks great. This is called a “Full Vision Quad HD P-OLED Display”. The P in the name stands for plastic, as it’s not made out of glass. This makes it more durable and less prone to cracks or breaking if you drop it. We’re expecting a similar setup on the new LG V40, but potentially even bigger. Some rumors suggest a 6.1-inch screen, while others claim it’ll be even bigger at around 6.3-inches. Mainly to compete with Samsung’s phones, the bigger OnePlus 6, and Apple’s iPhone Xs Max. So far we haven’t heard anything 100% concrete regarding the screen, or the size, but know that it’ll be a high-end AMOLED screen. We could get the traditional 6-inch screen, or we could get something huge. Either way, it’ll be better than the LG V30 last year, simply because LG had a year to improve its screen technology. And yes, it’ll have a notch just like you can lightly see in the image above. You can hide the notch with software if you’d like. Another thing to consider is the design of the new LG V40. It’s similar to the V30 last year, only with more cameras. Remember, there’s no longer a removable battery like the LG V10 or 20. That said, this was in order to add an IP68 dust and water-resistant rating, which is almost just as important. Both the V30 and 40 have water-resistance. You won’t get a secondary screen or anything either. It’s just one big screen. That said, we are hearing that LG will add a notch to the screen just like Apple, and similar to the LG G7. Early statements claimed they had an innovative way to extend the screen all the way to the bezels, but so far we’re not seeing anything new. You’ll be able to hide the notch with software, but don’t expect anything crazy like the OnePlus 6T. Basically, the design will look almost 100% the same. You’ll simply have a third camera on the back, the fingerprint scanner under that, and slightly smaller bezels on the front. Another important factor for any buyer is the specs and features. That said, we’re expecting something in-line with everything else released this year. Basically, the V40 will be the same as the Galaxy S9, Note 9, Pixel 3 XL, OnePlus 6, etc. Here are the numbers though. As you can see, the LG V40 sounds like a great phone. Big screen, plenty of power, fast updated software, lots of cameras and excellent sound. Seriously, this could fly under the radar as one of the top 3 phones of 2018. 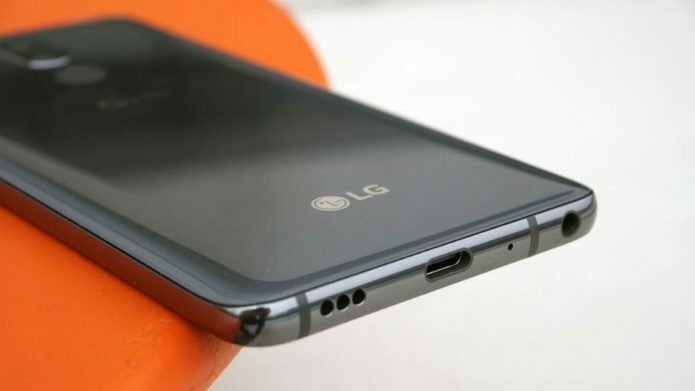 If there’s one plus, it looks like LG is keeping the 3.5mm headphone jack. At least for one more year. Otherwise, this is your typical yearly upgrade with no major changes. If you love LG phones, the V30 is still highly capable and a great device. Here’s where things really start to get interesting. LG wants to get ahead of the Huawei and Samsung competition, and they’re doing that by releasing the LG V40 this year with five cameras. Not 3 or 4….. but 5 cameras. Yes, you’ll get three cameras on the rear and two on the front. Here’s how we believe these will work and break down. Like the V30, the V40 will have either two 16MP cameras and one 20MP camera, or 16MP main, 13MP+20MP telephoto and ultra-wide lenses. Basically, you’ll have one main 16MP camera that’s fast and capable. You’ll get a second wide-angle lens that’s also 16 or so MP. Then, the 3rd depth and telephoto lens give you the best of both worlds. Now LG has the wide-angle that no other manufacturers offer while matching Samsung and Apple with the telephoto and portrait-mode stuff. Then, they’re adding a second front camera for improved selfies, portrait selfie mode, and possibly a new and improved Face unlock or Animoji competitor. We’ll have to wait and see. Either way, if the camera is important to you wait for the LG V40 and get it instead of the LG V30. The LG V30 is available as we speak, and you can get it from most carriers or unlocked. It launched for over $849 last year but these days you can find it from carriers like T-Mobile for under $700. In fact, T-Mobile wants just $690 for it. When can you buy the LG V40 and it’s five cameras? That’s the real question. Well, we know the LG V40 will get announced in a few weeks on October 3rd. LG recently sent out invites for the event. However, we don’t have an actual release date. In previous years they’ve taken well over a month to release a phone after announcing it, but we’re hoping they move quicker this year. A report from Korea said it’ll be available on October 18th, but recently leaked photos hint at a mid-November release date. Honestly, if they announce the phone on October 3rd and release it nearly two months later at the end of August, it’ll be too late. We’re hoping the LG V40 hits shelves before the end of October for around $849. We’ll update this post as soon as we know more.